Hobo Mama: AP Principle #4: Giveaway of a mei tai baby carrier for babywearing! AP Principle #4: Giveaway of a mei tai baby carrier for babywearing! THE GIVEAWAY IS CLOSED. The winner is Betsy! Go there to find an updated pattern to make your own mei tai! I'm so super excited about this post, because it's my very first giveaway, and it's a giveaway of one of my favorite things! I just realized I've been blogging for two years, so it's about time, right?! Ta-da! I'm giving away a mei tai, or Asian-style baby carrier! 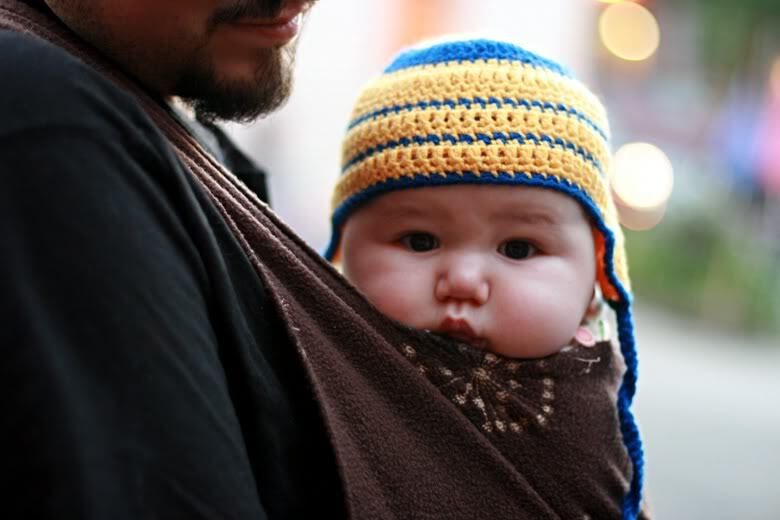 Since I'm skimping on the expository today, check out my attachment parenting primer for some more information about babywearing in general and a couple helpful links. Because I want to get back to the giveaway! In "Babywearing the heavy baby: mei tai," I raved about how comfortable and simple our homemade fleece mei tai (pronounced MAY TIE) was for carrying our tremendously large baby. The pattern we used can be found on WearYourBaby.com — well, at least, it used to be there before they changed URLs and presumably will be up again someday. In the meantime, you can check my post for the template image. I was making a new one for a friend who'd just had a baby and was wanting to have her hands free to get more done around the house. I adapted the WearYourBaby pattern a bit, based on our experience wearing it for over a year: widening the straps to make them a little more comfortable and lengthening the apron to make it come up a little higher on the back. I've continued to tweak, as I've just been making a couple new ones for still more baby gifts. I've decided this should be my thing: giving away a baby carrier to each friend or relative who reproduces. I had this idea that I could be a sort of ambassador of attachment parenting, but I'll talk more about that in a later post. 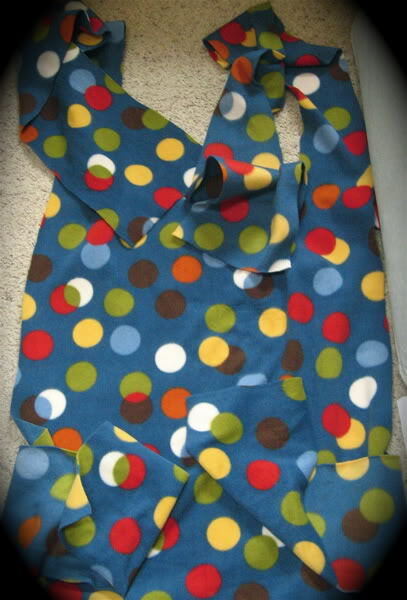 So, here's your chance to win your very own, Hobo Mama-made, fleece mei tai baby carrier. You can wear your baby in it or give it away as a baby gift. I don't even mind if you fib and pretend you made it yourself. Now, granted, make it yourself you surely could. All it takes is 2 yards of fleece (50% off at JoAnn's! ), sharp scissors, and the ability to use a tape measure. But...I know that when you're a mama, even the simple tasks can slip away from you. So if you can't find your scissors or make a run to the fabric store, let me come to the rescue with a free one that's already made for you! a. One mei tai carrier in her or his choice of stripey delight or polkadot wonder. (I just made up those names myself — can you tell?) These fabrics are cheery but not goofy and are gender neutral, so even men can babywear in them. This is true. Do not question me. b. One downloadable babywearing instruction sheet, showing how to put on the mei tai in a front carry, and including bonus safety and breastfeeding tips, complete with pictures and captions. I put this together myself in Word, which means it is definitely all that. • Like all baby carriers, it keeps your hands free while you get on with your exciting life. Baby is snuggled in close to you and can see the world from a safe vantage point. • The construction of the mei tai spreads the weight of the baby ergonomically across your shoulders and back. It ensures good positioning for the baby, too, keeping their bums well supported and their legs in a natural position. • There are several different carries you can do with a mei tai: front facing in, front facing out, back, hip. See my post on the mei tai for more information and helpful links. • You can breastfeed discreetly on the go in the front or hip carry position. • This style of carrier is popular with men and women alike, and it works for all ages of baby, from newborn up through toddler, so it will get a lot of use. 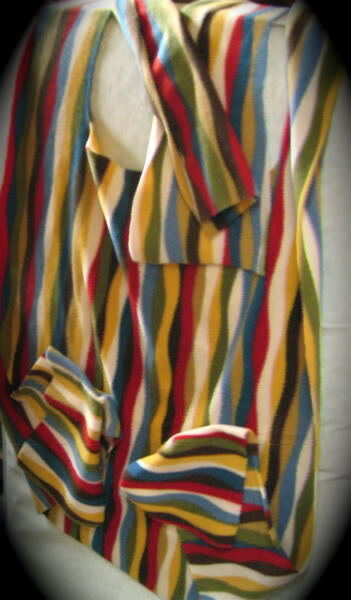 • The polyester fleece fabric is sturdy and won't unravel. You will want to hug your baby for the softness. It's snuggly on cold days, but the simple construction means it's not too hot for warm days. It folds up nice and tight to fit in a diaper bag. 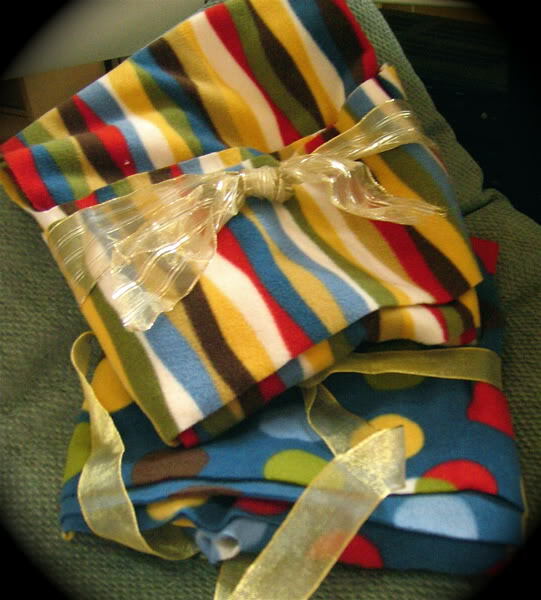 • The fabric can be used as a blanket or burp cloth in a pinch. Speaking of which, it's machine washable (and I did do a pre-wash in advance, fyi, using fragrance-free detergent and vinegar as a fabric softener). Fleece dries really quickly, too. I think I'm pretty much willing to ship it anywhere around the world. It's pretty light, and if it gets lost, at least it didn't cost much. So go ahead and enter, all my global friends! Hobo Mama, Crackerdog Sam, and Mikko Lint Picker are prohibited from entering. Everyone else is fair game, whether or not you have a hobo name. You can certainly use the baby carrier for your own precious baby. But you absolutely do not have to use the carrier yourself. It makes a splendiferous baby present if you would like to give a tool for attachment parenting. Giveaway will close Nov. 20. Is that a good day? I picked it scientifically, by randomly thinking of a date. That should give you plenty of time to mail it out for a Christmas present, if you so desire. I will then use a random number generator to pick a winner from the comments, so make sure you leave a separate comment for each entry. Shortly thereafter, I will announce the lucky winner and ship out your prize. I'm a little slow, though, so don't get too antsy. Make it easy for me to contact you if you win. Either include your email address in your comment, or have it easily accessible on the front page of your blog or linked in your profile. If I can't reach the winner or don't hear back within a couple days, I'll move on to someone else. This is 2 yards of fleece cut out in the form of a baby carrier. It is not as fancy-schmancy as one of them store-bought carriers. Be cautious with any fabric carrier. Check for tears or weaknesses in the fabric before each use. WearYourBaby.com is not endorsing this contest, because they don't know I exist. I just dig their pattern. They were kind enough to offer this pattern free of charge, for anyone's non-commercial use. I'm not selling these carriers, just giving them as gifts — first locally, and now internationally. If you don't win, you can still totally make your own, and I will even email you my handy-dandy mei tai instruction sheet if you'd like. Sorry my pictures of the mei tais stink. We lost our good camera's battery charger in the move (which box are you in?? ), and our old camera's viewscreen is all fuzzy and pink, so it was a challenge to see what I was shooting. I classed them up for you by adding the "vignette" effect in iPhoto. Snazzy! Leave a separate comment below for each entry. 3. Follow me on Twitter and tweet this giveaway. You can enter a separate Twitter entry once per day during the contest. Make sure to include @Hobo_Mama and post the link here. You can use this text if you'd like: Wear your baby! Win a fleece mei tai baby carrier @Hobo_Mama http://bit.ly/T9QeR #babywearing Enter by 11/20. 4. Leave a new comment on another post of mine, and let me know where to find it. I'm a comment whore, so why not use this as an opportunity? 5. Subscribe to Hobo Mama's RSS feed or click Follow Me on my sidebar at right. (See above for why I'm begging.) If you already subscribe or follow, just leave a comment saying so. 6. If you understand how StumbleUpon, Digg, Technorati, or so on works, more power to you. I seriously have no idea. Well, Digg makes sense, but the rest confuse me. Anyway...feel free to recommend or fave an article or my blog at one or more of those sites, and leave a comment for each one. There's a little "Share" button underneath each post and on the sidebar to help you out. Bonus entry if you can explain to me how these sites work! 7. Come on, that was plenty of entry possibilities. Don't get greedy. But do go and win, win, win! did a twitter entry about the giveaway..
i dont know if that's the url you need or what.. i'm not much of a tweeter. i am a follower.. and also subscribe with bloglines.. go me! I'm subscribed to your blog via Google Reader! :) - one entry! Off to blog about it now. I want that cute mei tai! LOL! I'd like to give a mei tai to my sister-in-law whose baby is almost big enough for one. I already follow you and have an RSS feed on my blog, does it count anyway? this looks great! and i LOVE that you're willing to ship anywhere. i would use it for my 13-month-old, now that my 3.5-year old insists on being carried around 'like a monkey' in the one i already have whenever we go for family night walks. (plus, another baby carrier never hurt). it would also get lent out to friends and family whenever possible. ...i'm now a follower, too. Well you know I'm a babywearer because you've been to my site! :) So here is my first comment to let you know that I (or my hubs) will be the one using the MT. I can't access twitter or any other fun social network from work so I will be back once I'm at home! I've clarified a point in my post — if you already follow or subscribe, just comment to say so as Edenwild did. Hi! I just tweet this entry and started to follow Hobo_mama on twitter. I would be very, very, very happy to win this mai tai. I would carry my 4 months old baby girl and the next babies who (hopefully) would come. I will use the ABC. I have a 3mo boy that loves to be worn. Awesome! I'd love to win this, and use it for my 9 month old son. I tweeted the giveaway, and follow. 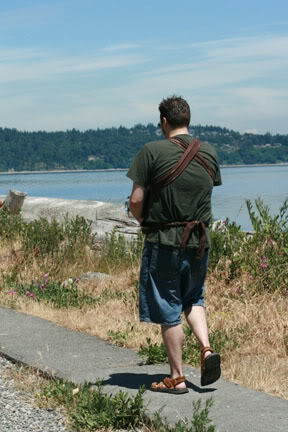 I made my own carrier with my last baby (11 years ago!) and loved it, but can't find the pattern. I probably wouldn't find the time to make it now anyway. Thanks for the giveaway! I love your blog! I need to figure out how to follow it as an RSS from my blog. As it is, I just have you linked on my blog. I use Stumble! Basically, you can click on "Stumble" and get a random website relating to any of your pre-selected interests. Alternatively, you can choose to "Stumble" upon a random website relating to any particular interest. So, if I'm in the mood to read about Parenting, I choose that topic and click Stumble in my tool bar. Stumble offers a thumbs up "like it" or thumbs down ranking system for any site you view - whether you accessed it through the Stumble button or not. I have ranked your AP Primer article with a thumbs up and offered the following review, "This blog gives real down-to-earth explanations of Attachment Parenting to which you can relate!" I classified the page under the Parenting tag. (Only one tag allowed per review.) It seems I am the first person to review this page (according to Stumble). I am glad to help spread the word about your blog, it is a wonderful resource! I love that you always provide so many links, too. You really do your homework! I was checking the FAQs on LJ to figure out how to add your blog to my LJ Friends page as an RSS Feed because I knew it was possible. I don't actually subscribe to any RSS Feeds. I created a syndication on LJ for you! HoboMama was already taken as a user name, so I used HoboMamaBlog. (Apparently anyone can create an RSS Feed on LJ for any site.) It will start updating tonight! I am so excited to have even easier access to your articles! I'll be a first-time grandpa in a few days---maybe Monday. I would carry Cade around to show him off, and might even let his mom and dad use the mei tai carrier once in a while. Anyway, thanks for the chance to win. I'd use the carrier myself. Hoping to have another baby soon and would like to try the Mei Tei, as I've always heard good things. I would use it for Snapdragon, I think. Its plausible that I'd give it away, though. I have this fantasy where I am babywearing and a mom syruggling to carry her infant comments on how nice it would be to wear their baby, and I pull a second carrying devise out to show her how it works, then when she likes it, I habd her an instruction sheet and walk away. I love that fantasy. I tweeted again! Wow, I thought you'd have hundreds of entries by now! I guess people don't need/want a mei tai? Oh, well, better chance for me! LOL! I've got three month old twins, so this carrier would see a lot of action!! existere.wordpress@gmail.com or, more reliably, existere on twitter!! Tweeted again! Wow, I feel like such a hog entering so many times! LOL! Wow, really? No one else since my last post here, over 24 hours ago? :( I'll put it on my blog again (for free...LOL), but I just tweeted again too. Oh, and I also commented on a 2nd post, but I'll just combine the two. I don't want to get TOO piggy! LOL! Cade Stephen arrived yesterday, November 4, 2009, so we are ready to use the mei tai carrier --- 7 pounds 15 ounces, 19 inches. Just checking in to say "hi" & "good luck"! I'm linking up blog posts about the giveaway in my reminder post, so if you have a link that's not listed, let me know and I'll add it. Thanks to you all for blogging & tweeting and helping get the word out! Kara: You're cracking me up with the story of failing to make it the proper dimensions. My first couple times I had to measure, like, 12 times, and I still almost cut it wrong! It should be easy, though, right?? Now that I have one cut out, I just use it to trace around -- much easier! Medina: If anyone has a giveaway for me to promote, let me know. I love doing giveaway round-ups. Of course, it has to be family- or mama-oriented, but usually my bloggy friends' giveaways are! Nikki: Thanks for the link & tweet! Leanna: Thank you! I RTed you. Kathy: Yes, it's such a challenge to find scissors! They disappear so easily. We have about 5 pairs, and can never find any! jorjedatoy: You're my superstar! Absolutely you get your extra entries for explaining teh internets to me. Thank you for the Stumble info and for tagging me there and listing me on LJ! You're awesome. Oh, and your little baby sounds sooo sweet. Sasha: Congratulations on your sweet baby girl to come! I hope her heart problem is quickly resolved. I know babywearing can be so wonderful for babies with Down Syndrome, so happy snuggling! Steve: Congratulations on new baby Cade & your foray into grandparenthood! Yea! Is his middle name after you? Healthy weight, great name, loving family -- sounds like he's off to a great start! Elita: I think mei tais are so simple (in a good way) that I think you'd love it for any new baby to come along! Slee: I LOVE that fantasy, too! I have exactly the same one! Cindy: You think you'd be happy to have more of a chance to win, lol! Thanks a bunch for all the tweets and links. I would love to have this for carrying my 13 month old as well as our new little one coming in March! I'm a little bit obsessed with carriers, and have made a wrap (if you can call cutting a piece of fabric in half *making* it) and am in just moments about to attempt my first pouch. I would LOVE to try out a mei tai! I just Stumble-reviewed your How to photograph your baby for the beginning photographer as a thumbs up. I figured out how to include multiple tags, so I used photography and parenting. Yeah, Cade shares the name with both me, Stephen Ray, and his dad, Caleb Stephen. Found out today that he has Total Anomalous Pulmonary Venous Return (TAPVR) and will have to have heart surgery to repair the problem. So your prayers are appreciated. If I win this baby carrier I will try it on my 17 mo. old (Oliver) and my newborn, whenever he or she arrives (Special Agent 3). Whoever likes it best will get the free ride. Looks nice and cozy and like it would fit over a winter jacket! My cousin who is due on December 4th would make good use of the carrier! I'd love to win this--I'm due with my son in February!! I love the gender-neutral prints, too! Hello, dear! If I won, I'd probably give it to one of the several bloggers I read who are having babies this month. Follow on Twitter & tweeted @ http://twitter.com/Naddez/status/5519529597. Perfect for my upcoming niece or nephew!! Thanks for the chance. My hubby and I are currently TTC o I wuld be using this carrier when our little one arrives [hopefully 2010]! I am very excited to try this because we have a bjorn which my husband and I have to readjust constantly as we are different sizes, this product will help us out very much! I commented on your new entry, Guest Bloggers. 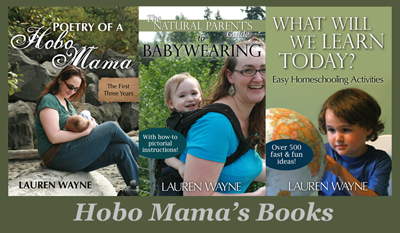 So happy to find you, Hobo Mama, while researching better baby carriers! What will I be doing if we win yours? WRITING. My little gem, Emily, makes it tough to get any work done at the computer because she wants to help a little too much. If I can press her close to me and have two hands free, I would be at least twice as productive in the prose department. I'll be taking a whack at making a Mei Tai, but it could take me until Christmas. Thanks for the giveaway and all the parenting advice. What a great contest- If I win I will be wearing the mei tai with my little girl due in March. Blogged about your post here! I'm having a baby boy in Dec (my 2nd child) and I would use it with him! thanks! I would use this for my baby! I've been looking for something like this! i would give this carrier to my dear friend, who just had her first child and hates to be without him. My good friend just moved to another country, and I want to give her a bunch of fun things for her son (due in a few weeks) since I can't throw her a shower there. This is her first baby, and she is very excited! I'm glad that the patterns are gender neutral, because I am sure both she and her husband will want to use this. I love the idea of a fleece carrier for winter! Now I just need it to get cold...I know, San Diegans shouldn't complain about the weather, but it's nice to wear your fall clothes and have a hot drink sometimes! I would wear this with my son, Levi, and whoever comes along next. My niece would use it for her first baby about to be born. This would be gifted to a young very poor couple I know. They have lots of needs for their month old baby, and this is one of them! Thanks for the contest, it's sweet. i love mei tai carriers! i have one but we are having twins this spring so it will be handy to have another one! Hi, I would give this to some great friends of mine who have just had their first child. They are an awesome couple; they have been married for some years, but wanted to wait until everything was just right before having children - like buying a house which they also just did! I would use it my very own self when I have my baby in April! Thanks so much! This would be for the brand new grandchild!! I would love to win this carrier! We are due with our second baby in three weeks and I have wanted to buy a sling or something to hold baby sister close to me while chasing around big sister! I tweeted again! :) Oh, this is Cindy, btw! I changed my profile. Okay, I know this is lame because it was only a few minutes apart, but it is after midnight now, so I tweeted again! LOL! I would love to win this. I would definitely use it to carry around my soon-to-be-born baby. I would use it with my baby due in January! Thanks! susanbaranow (at) yahoo (dot) com. Thank you! I will use the carrier! I'm expecting and can't wait to carry my little one around!!! i will be using the carrier my baby is due in 2 weeks!!!!!! I commented on the post "Wordless Wednesday: Attachment Parenting throughout the ages"
Oh, this would be awesome to win! Will be wonderful for use with my 8 wk old lovey girl. Cool. I love babywearing. I would definately try this wrap out with my tot! I posted about your contest. I would give this as a gift to a friend expecting a baby! I'd love to give this to my friend who has a new grandbaby. I'd love to have your "handy-dandy mei tai instruction sheet" whether I win or not. Thank you! I will be going to a baby shower soon and this would be a great gift to give them! I would give this to my sister for my new little nephew! MY sister in law. She is due at the end of Jan. I also follow your blog with Google Friend Connect! If I win, I intend to give this to my daughter who has a 3 1/2 week old baby to carry around. She will absolutely love it! Thanks for hosting your first giveaway! I am following you on Twitter and I tweeted about the giveaway at http://twitter.com/kennarog/status/5870064810. Last day for entries! If you want to tweet one last time, go for it & then leave another comment! I feel like each and every one of you would put the carrier to good use, and I wish I had one for everybody! I hope the rest of you will consider making your own, because it truly is really easy, or check out my November giveaway roundup, wherein I list several other baby-carrier giveaways (in the post and in the linky below). Susan: I love that it would see lots of creatures! I will try to figure out how to post the instruction sheet. I was having some printer issues that I think I've ironed out. To all of you with a baby, I love that you're holding them close! To all of you expecting or wanting to expect a baby, I wish the very best for your pregnancy and birth. To those gifting the carrier to someone special, what a generous gift! Thanks to everyone for visiting and entering and sharing your stories! I became a fan on Facebook. Does that count for one more entry? Yeah, I am a babywearing freak! I will wear my baby boy, and any other baby that will let me! In fact, I am wearing my son right now while he naps, and I do chores (read blogs). Great thing about babywearing, babies NEVER go out of fashion. And if they get to big to wear...just make more! I would use it! They are beautiful! I posted a comment on Spanking as Just Kinda Creepy. Also, I wondered... do you get notices of comments? I've commented on some other older entries, too... so I just wondered. I haven't entered up til now since I already made my own carrier and wanted the opportunity for someone else to have one since IT ROCKS! I've also given your instructions to several other people. Since you are the expert though, I will enter to win for my friend Kristen who is 12 weeks or so pregnant with their second. This would make a great (and free!) shower gift for her! I would use it but I think I would also let my mom use it. She would love it i think! My friend would use this carrier.